In 2014, Girls Just Don’t Do That has gotten a facelift, and is now the first book in the newly-minted CRAVE trilogy. Three Degrees of Separation, the second book, will be available in May, featuring a now out-of-college Jayne and a new circle of women. 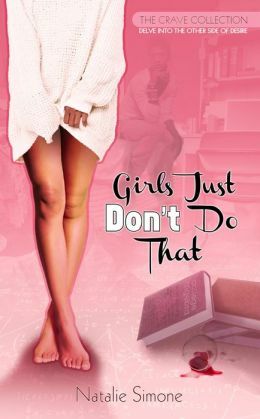 In anticipation of her newest book in the CRAVE trilogy, Natalie Simone would like to bestow 5 lucky winners an autographed copy of her book, Girls Just Don’t Do That! To enter, please fill out the form below. In the meantime, watch Simone’s video preview of Girls Just Don’t Do That.